Getting even colder in Chiang Mai ,we had 11 degrees max today.Sadly quite a few older people in villages have died overnight when it was close to zero. Last Sunday it hit 35 degrees here . The Meteorology Department predicted Wednesday temperatures will drop by eight degrees Celsius across much of the country over the next three days after a strong high pressure zone from China reaches upper Thailand tonight. During that time, the upper part of the country will experience cool to cold weather with strong winds in some areas. Temperatures in the North will drop between six and eight degrees, according to the weather forecast issued on Wednesday evening. The North, the Central and the East will initially face thunder showers and afterwards temperatures will decrease by four to eight degrees. The department warned people to take care of their health due to the weather change. Meanwhile, a northeast monsoon that prevails over the Gulf and the South of Thailand will intensify. Strong winds and waves 2-3 metres high are likely from Chumphon and further south. The weather officials warned that people living in coastal areas should be aware of inshore surf. All vessels should proceed with caution and small boats must keep ashore during Feb 24-27. The power has already been out 3 times in the last 2 days. Not going to miss you by the looks of it.37 degrees in Chiang Mai and still no rain. People in 14 provinces in the South and the East have been told to brace for heavy rain and rough seas from today through to Aug 3. The Disaster Prevention and Mitigation Department on Friday issued the forecast on Friday, along with a warning that smallboats in the Andaman and Gulf area should stay ashore. Provincial branch offices were placed on full alert to react to storm damage including floods and landslides. Director-general Chatchai Promlert said the southwest monsoon in the Andaman Sea, the South and the upper Gulf of Thailand would bring isolated heavy rain over the East and the Southwest coast between Friday and Wednesday. Waves in the Andaman Sea would be 2-3 metres high. Fourteen provinces in the two regions were likely to be affected: four provinces in the East - Chon Buri, Rayong, Chantharuri and Trat; and 10 provinces in the South - Prachuap Khiri Khan, Phetchaburi, Surat Thani, Chumphon, Nakhon Si Thammarat, Ranong, Phangnga, Phuket, Krabi and Trang. Woke up this morning to some furniture (pretty heavy stuff, NolaK dog carrier was one) blown off the patio in a big wind from last night. Electric off for an hour around 3:30 (reported for those that partook last night). You guys get all the fun. I had a lovely cool, refreshed walk on the beach at Hua Hin last night. Waves were a little boisterous, but no flying dog carriers . It has it's advantages living in Hua Hin's micro-climate. 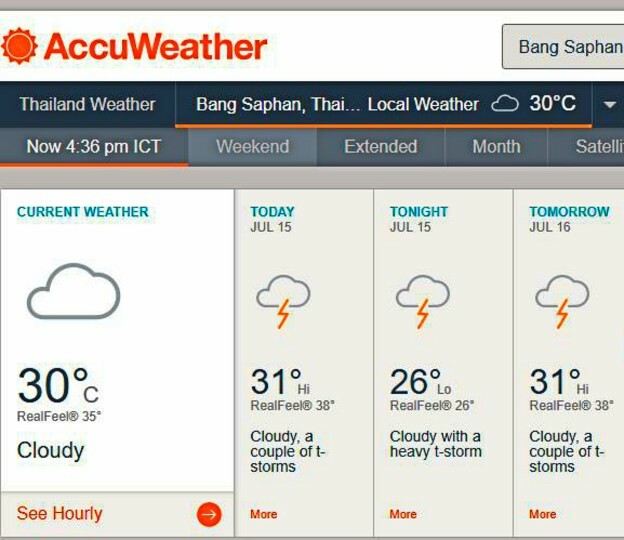 I think these weather warnings that include Prachuap Khiri Khan should have a caveat, excluding Hua Hin. 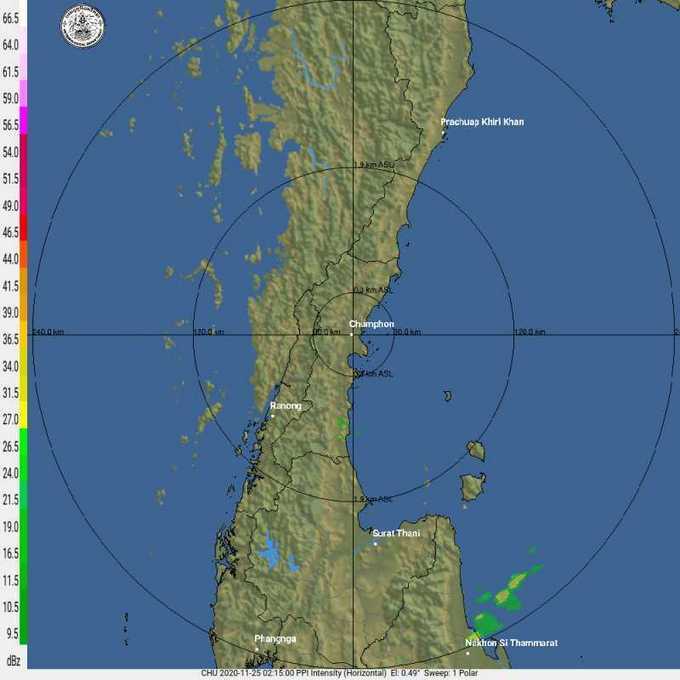 current weather forcast report is attached below and here you can see more details. Panlop Singhaseni, the governor of Prachuap Khiri Khan province, has ordered concerned officials to be prepared to cope with another round of flooding as the Thai Meteorological Department has predicted all 16 southern provinces will be hit by heavy rain brought by a depression storm from the night of Nov 1. Mr Panlop gave this order while on an inspection trip to the Nong Ya Plong bridge at kilometre marker 365+628 and Wang Yao bridge at kilometre marker 386+542 on Phetkasem highway (Highway 2). The two bridges were severely damaged by strong currents in the first round of flooding early this year, bringing traffic on Highway 2 to a complete halt for several days. Bailey bridges were built at the two sites for temporary use. Apichart Chanthanyakorn, director of the Prachuap Khiri Khan highway office, said the repairs of the two bridges were completed in July and September respectively. The two bridges have been reinforced with thicker concrete so that they would not be easily damaged with hit by heavy logs. He was confident the two bridges would not be affected by the new round of flooding expected to be brought by the depression. Unlike all messages about possible flooding, we haven’t had a drop of rain this week, at least not in in Ban Krut. It’s only a bit more windy. According to http://www.tropicalstormrisk.com/ , our area is likely going to be hit on Monday 6 November, by typhoon Damrey. Looks like the rainy season could be coming to an end, the winds are up again. Noisy kite season is coming!